Sure winner of the "games with the most monikers" award if there were such a thing, Legend is a great RPG that is also known as Empire and Four Crystals of Trazere. 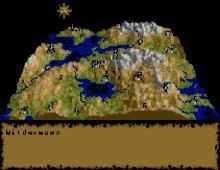 Despite the typical kill-the-big-foozle plot, Legend combines traditional RPG elements with such innovations as real-time play (where you see other parties marching on the map and the passage of night and day), and fun strategic options that make it reminiscent of Mike Singleton's classic Lords of Midnight. One of the game's best features is the neat isometric view that the game shifts to when you enter dungeons (similar to The Summoning), complete with excellent automap. The game's spellcasting system also deserves mention as one of the best interfaces ever: you have to mix different ingredients, which must also be paired off with the correct magical rune for the spell to work. Although character classes are limited only to Berserkers, Troubadours, Assassins and Runemasters, gameplay is balanced quite well with one character from each class. With outstanding graphics, fun gameplay, and a truly epic quest, Legend is an outstanding underdog. Be sure to check out its sequel Worlds of Legend which is based on the same engine, and has no lesser a number of alternate names. Recommended!